Paying homage to not only the translated title of his feature filmmaking debut but the film’s overall theme, subject and recurring motif centered on the idea that in the urban neighborhood where the movie takes place there’s a weird rumor going around about squatters secretly living inside people’s apartments, first time helmer Huh Jung plays hide and seek with the audience in Hide and Seek. Utilizing the idea of hide and seek on a number of levels, Jung first introduces us to the hardworking everyman father who will later be thrust into a frightening mystery by initially showing him playing the titular game of hide and seek with his spoiled children – only to bookend the picture with a tonally opposite showdown at the end. In stark contrast with the sequence that establishes our lead as a committed parent in the first act, Jung ups the stakes with a sinister life and death version of the game the protagonist must play with the recently unmasked villain in the chilling (if admittedly slightly illogical) finale. Yet in addition to the overt game-playing, Jung uses the basis of the game for his cinematic plan of attack to hide in plain sight – playing on audience stereotype, perception, genre expectation, gender bias, point-of-view, red herrings and more in some truly clever ways. By flirting with the idea that it’s a Ring or Grudge style supernatural thriller at one point and making us question whether or not we can trust our protagonist’s point-of-view by indulging in a few odd dream sequence that echo everything from The Shining to David Lynch, Jung has a lot of fun figuring out how to manipulate the viewer in ways that would’ve made Hitchcock smile. Yet our unreliable (or reliable) narrator is the least of our worries as there’s definitely something twisted going on in Jung’s psychological puzzler that’s bursting at the seams with plot. One part a familial mystery that deals with guilt that goes along with estrangement and coming-of-age and one part traditional horror movie given its ‘80s throwback opener that whacks a girl before our very eyes minus the gore, Hide and Seek is all-around creepy. After the film's wealthy restaurateur protagonist gets a call that his long estranged brother has gone missing, he’s pulled into a much larger mystery when he visits the rundown complex on the verge of being demolished where his brother most recently called home. Was his brother the hooded stranger in the opening sequence who killed his beautiful neighbor? Could he be another victim of an as yet unidentified devious mastermind or is there something even stranger going on altogether? Discovering eerie symbols etched below the doorbells of every apartment that appear to describe its inhabitants with symbols (for number of parents, children and gender) as well as peep holes and fake walls leading from one apartment to the next that again calls back to the horror evident in the opening scene, our protagonist soon encounters a single mother who warns him that his brother is to blame. Screaming at our hero to make his estranged brother “stop peeping” at her daughter, our protagonist leaves shaken and horrified being that he’s got two young children of his own. Unfortunately, when the source that’s causing so much evil somehow follows the main characters back to their posh apartment building, things quickly go from bad to worse as they discover that technological shortcuts have made it not only impossible to hide but that much easier for others to find them since contemporary life has everyone living in plain sight. In wanting to salute a variety of genres while also trying to play on viewer expectations, Jung’s enthusiasm does tend to get the better of him at times. To this end, the film suffers from its overabundance of ideas that confuses the complex narrative thread he was attempting to weave throughout the house of cards-like structure. And while it would’ve been better served to zero in on the psychological thriller angle that it ultimately indulges since as it currently stands, it now seems a bit rushed (by first flirting with possible solutions in the supernatural thriller and traditional horror realm), it’s still a sophisticated puzzler all the same. Thus while Jung is brilliant at knowing how to ratchet up fear in certain key scenes involving children (despite how outrageously bratty the main character’s kids are throughout the picture), at times he’s so entranced by the prospect of hide and seek that he forsakes logic by dragging things out in order to have any excuse to play the eponymous game. Although it’s so entertaining that it's easy to overlook, the final confrontation with the murderer goes on for at least a good five to eight minutes too long due to some problems with common sense and surprisingly bad direction. One of those scenes where the number of people able to band together and defend against the villain’s attack should’ve been more than enough, instead of letting a character or two call for help or go on the offensive (more than just a single hit), Hide and Seek’s otherwise bright characters suddenly become horror movie clichés. Not revealing the fate of two supporting characters until much, much later including one where you don’t know whether someone lived or died for several minutes (and another that appears in an obligatory genre-specific ending that leaves the possibility open for a spin-off), it’s a wrong step in a movie where otherwise so much had gone right earlier on. 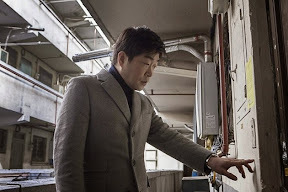 While likewise I would’ve cut at least two of our lead’s nightmare sequences since they go absolutely nowhere and don’t serve the storyline overall, Hide and Seek is an otherwise truly inventive, twist-filled moody thriller that Hollywood is sure to turn into a bankable English language remake since the film broke box office records in its native Korea. 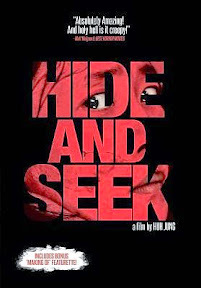 Though it's an open secret overseas, thanks to its great word-of-mouth campaign as well as this Region 1 DVD release from Film Movement’s edgier sister company RAM Releasing, Hide and Seek won't remain hidden from American filmgoers for long.